Today, when you order "Aldo Colombini's Impromptu Card Magic Volume Two", you'll instantly be emailed a Penguin Magic gift certificate. You can spend it on anything you like at Penguin, just like cash. Just complete your order as normal, and within seconds you'll get an email with your gift certificate. 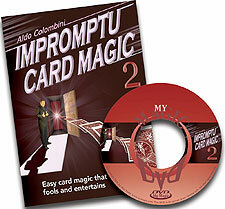 Aldo Colombini's Impromptu Card Magic Volume Two (DVD) All you need is any deck of cards and you're ready to perform high-impact routines. Small Talk (Richard Vollmer): The spectator thinks of a card at a selected number that is found in a surprising way. Come Together (Jay Sankey & David Acer): Acting as the magician the spectator has two cards selected and lost in the deck. Without any interference from the magician the spectator magically locates both selections. The Magic Lesson (Roy Walton): The four Aces are mixed into a small packet of cards. All the cards are now blindly eliminated leaving only the four aces in your hand. 4-5-6 (Al Thatcher): A selected card is lost in the deck and found while the spectator is dealing the cards. Sloshed Or Sober (Paul Gordon): A selected card matches a prediction while the card used to locate the selection also finds its mate. Jackula (Michael De Marco): The two Jacks hunt through a small packet of cards capturing the selected card. The Cape Canaveral Trick (Paul Swinford): Counting through the deck in a rocket launch sequence a card is found which matches a prediction that was in full view. Silent Fall (Aldo Colombini): A prediction card is placed on the table. A signed selection vanishes from between the four aces. When the prediction card is shown to be the signed selection. Countdown Location (George McBride): A selected card appears at a selected number. Divertimento (Aldo Colombini): The cards are shuffled face up and face down. When the cards are spread on the table all of them are facing the same way except for your magic card, which is surrounded by the two selections. One For All (Aldo Colombini): A freely selected card completes the three prediction cards to make a four of a kind. Back Up (Aldo Colombini): Two selections magically reverse themselves in the middle of the deck. Elevon (Aldo Colombini): An elevator routine where the Ace, two and three of Spades rise from the middle of the deck to the top. As a surprise climax the cards are added to form a six of Spades while in the spectator's hand. ESP Numbers (Aldo Colombini): One of ten cards is selected and mixed. It is found by spelling to a spectator's name. 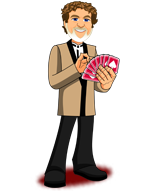 As the ten cards are dealt in pairs on the table their total in every case equals nine, which matches your prediction. Maestoso (Aldo Colombini): A selected card vanishes from between the two Kings that were placed inside a cardcase. Produced by Meir Yedid Magic. Original release date: August 2005. Running time: Approximately 80 minutes.